I would be happy if glass blocks were never used again. I have always hated them, everywhere, every time, every circumstance, forever and ever in perpetuity. 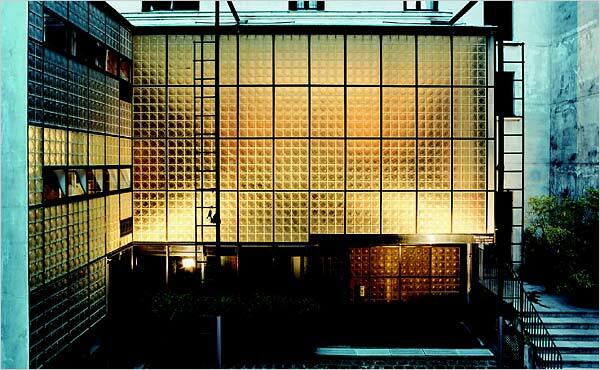 I blame architect Pierre Charreau and Maison de Verre by for starting this fascination with glass block. Maison de Verre (House of Glass) was built in 1932 and was constructed in the early modern style. (I wrote a post of the working man’s rules of modernism here). Maison de Verre stressed honesty of materials, adoption of the machine aesthetic, express the structure of the building, and rejection of ornamentation. This is actually a really great house and a case study of early modernism. This project warrants attention now for many reasons, most notably could be that it is a urban adaptive re-use and renovation of an existing building. The patron owner had wanted to tear the entire building down but the tenant on the top floor refused to sell so Maison de Verre had to be built underneath the top floor. This is a great project and if glass blocks had never been used again, I would probably still like them. The French invented glass blocks in the early 1900’s and sometime around the 1930’s developments in machine production made a project like Maison de Verre possible. Maybe if you’re French you know how to design with them, otherwise I challenge anyone to show me a project where the use of glass blocks actually improved the architecture where no other building material could have worked with far better results. So why would someone want to use glass block? It is typically used for creating some sort of visual screen (like glaucoma) between spaces to provide privacy while allowing light to pass through. That description sounds like a window to me, so let’s look at some visual examples of the variety of uses for glass block. Why did the family pictures on the wall go away and why did someone think there needed to be a wall here? Do you suppose the person who routinely sat in the chair was worried about being attacked from the rear? I am going to assume that these are both toilets….unless the designer thought it would be a good idea to have the owner use the toilet, waddle like a duck, sorta hunched down with your pants around your ankles, presumably through the shower space, over to the bidet. There are other clues here that bring the owners taste into question; fuzzy toilet covers, black and white motif, surface mounted track lighting from aisle 12, the subtle ceiling coffers above each toilet (is that a basket of fruit on the right?). I could write an entire piece about this one photo. This could be a bathroom from the movie Scarface. Aahh, technology has been introduced to update the look of glass block. Hot pink fiber optics always make the right design statement but when combined with the sophistication of glass blocks – unstoppable! You knew it was just a matter of time before the curved glass block wall made it’s appearance; and just like the wildebeest roaming the serengeti, it’s numbers are in the millions. This is the very definition of velvet rope design. Have something that doesn’t quite work out? (like a hallway you don’t want people going down that you put in a place where everyone wants to go down – just solve that pesky problem with a velvet rope). The space might not have been very pleasant with half the ceiling over your head is sloping down onto your head so some glass blocks, laid out in a soothing geometric pattern, will let in oodles of natural light and make everything mo’ better. Notice the conflict of angles between the sloping ceiling and the stair-stepping glass blocks. All that is missing from this picture is a dusty fabric plant sitting in a plastic pot. And some ant bait back in that corner. Have I made my point? Glass bocks should never, ever be used again….unless you’re French.